A simple Google search will probably show you 5-10 gyms within a 5 mile radius from your home, but not all gyms are the same. Get to know the gym before you join—almost all offer a free trial. Gym philosophy is crucial. You need to know the philosophy of the gym coincides with your goals, that the trainers truly care, and it’s a place you’ll truly want to attend. If you have to drag yourself in there day after day you will not maintain consistency and not succeed with your fitness goals. Don’t be bullied by high-pressure sales pitches that require immediate and long term signup! And don’t just take the staff’s word, talk to the members and learn what it’s all about. John was pressured to come into Triplex over a year ago from his wife who was a regular attendee. He was very hesitant and not sold on the whole “group” fitness. 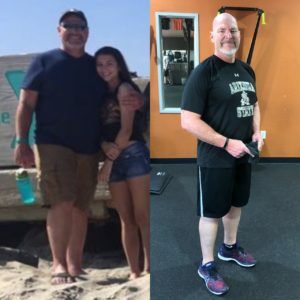 But after a year of regular workouts and some amazing body changes John is now a stable member himself- encouraging others to make the life change. Q: What didn’t you expect? A: I didn’t think I’d ever be in great shape again. I also didn’t expect the social aspect of Triplex Training. I’ve met so many great people and I look forward to seeing them at workouts! When I’m in town, I workout 5-6 times a week and I didn’t expect that! Q: What is your fitness level/lifestyle like after joining Triplex Training? A: I’ve lost 40 pounds! I’ve gained a significant amount of muscle mass, have eliminated my blood pressure medications, dropped resting HR from mid 80’s to low 60’s, and my chronic low back pain is gone. I’m 53 years old and can hang with pretty much everyone at the gym! Q: What should potential new clients know about Triplex Training? A: The coaches are supportive, but not in your face. They will correct your form so you can get the max results and avoid injury. They also organize events outside of the gym like happy hours, group hikes, etc… If you’re getting back into shape like I am, the support is fantastic!